This game will teach students about the resurrection of Christ—that he ascended, and he will definitely “descend” to us again someday. Students must keep the balloon from touching the ground only using their feet. Easter Sunday marks the day that Jesus was resurrected. He passed on to Heaven but he came back because his time with us wasn’t over. 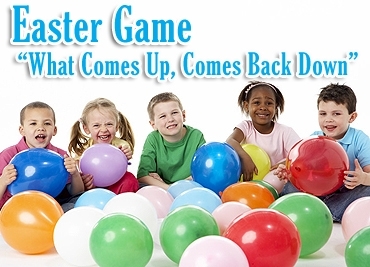 We’re going to further our learning about the resurrection of Christ by playing a game. Have students put their hands on the ground so that their backs are facing the floor. Make sure they are all “standing” with their feet and hands on the ground. Toss a balloon into the middle of the class. Students have to keep the balloon in the air at all times. They may only touch the balloon with their feet. The goal is to keep the balloon in the air as long as you can. Keep a timer going as the students are playing. If the balloon touches the ground, the timer starts over. For an easier game, have students stand up and use their hands/feet to keep the balloon up. Luke 24:46-47 talks about Easter like this: “The Messiah will suffer and rise from the dead on the third day, and repentance for the forgiveness of sins will be preached in his name to all nations, beginning at Jerusalem.’” Jesus was sent to earth to be our savoir. After three days’ time, he rose from the dead and came back to us. He came back down just like the balloon in our game came back down. One day, Jesus will come back for us again. That day could be as early as tomorrow or as long as a thousand years from now. But what God wants us to know is that Jesus is going to come and, until he does, we need to know that we are always being watch by Jesus. He is always looking down on us and guiding us towards our entrance into eternal life.